TVXQ! 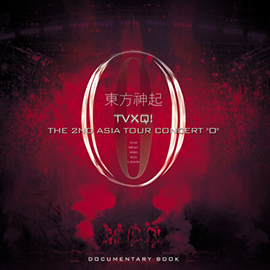 The 2nd Asia Tour Concert “O” was the second international concert tour of TVXQ!, in support their 2006 third studio album, “O”-Jung.Ban.Hap.. TVXQ! toured five countries and seven cities across Asia over a period of 16 months from 2007 to 2008. It was TVXQ! first major concert in the mainland China and Taiwan. The tour’s theme, War and Peace, was based on the title song “O”-Jung.Ban.Hap. from the album of the same name. The theme was used as a message to bring new hope and peace for a world that is dark and desolate. TVXQ! set a new record as the number one foreign artist to attract the largest number of fans for two years in a row. The tour was officially announced by S.M. Entertainment on January 8, 2007, with dates for the shows in seven Asian cities. TVXQ! performed songs from their Tri-Angle, Rising Sun and “O”-Jung.Ban.Hap. albums. The show lasted for about two and a half hours while the Seoul encore concerts ran for three hours. TVXQ! performing “Remember” in Beijing. Photo: S.M. Entertainment. According to S.M. Entertainment on January 8, 2007, TVXQ! would perform in Seoul, Beijing, Shanghai, Taipei, Hong Kong, Bangkok and Kuala Lumpur. The show in Hong Kong, however, did not take place. No announcement was made by the agency regarding its cancellation but the Hong Kong stop still appeared in the tour’s various promotions. 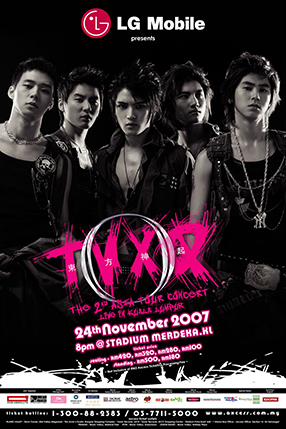 Ticket sales for the Seoul concert took place on January 15, 2007 on Interpark. About 24 songs were performed in each show. 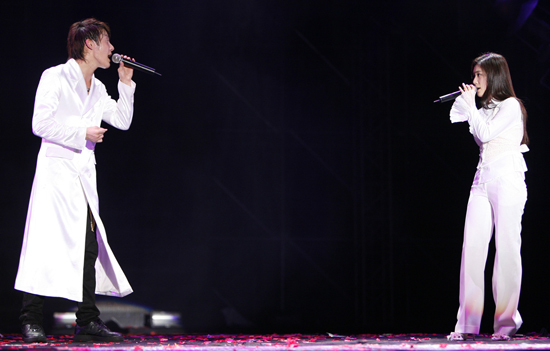 For the solo performances, Junsu and Yunho sang their self-composed tracks, “My Page” and “Spokes Man” respectively. Super Junior’s Donghae, being a special guest, performed the rap for “Spokes Man” throughout the tour. Yoochun performed a live cover of Brian McKnight’s “One Last Cry” and Changmin sang a jazz cover of Extreme’s “When I First Kissed You”. 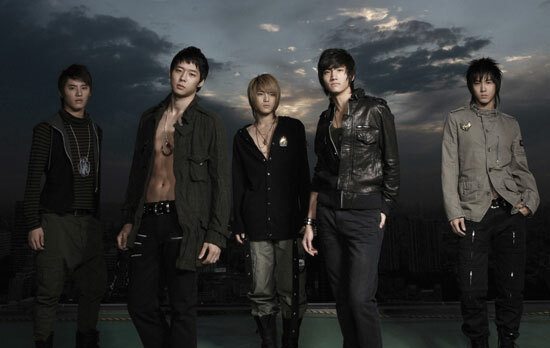 Jaejoong sang a live cover of “Crying”, an original from the 1999 Korean band, Flower, under the same song title. TVXQ!’s labelmate, Zhang Li Yin, made her guest appearance in the tour and performed “Tri-Angle”, singing a part in the song which was previously performed by BoA. She was the regular guest star for the same concert until its finale in June 2008. Kim and Zhang performing “Timeless” in Kuala Lumpur. Photo: S.M. Entertainment. Two songs were only added to the Seoul encore concerts, making it 26 in total. “믿어요(I Believe)” was replaced with a new R&B song produced by Junsu, “네 곁에 숨쉴 수 있다면(White lie..)”, while Japanese tracks “Sky” and “Love In The Ice” were added to the set list. Based on the February 2007 set list, “Timeless” was added for the Kuala Lumpur and Bangkok shows. The duet song between Junsu and Zhang Li Yin was performed after “Remember”. A Chinese rendition of “Hug(포옹)” was performed in Shanghai and Beijing. On February 23, 2007, the first show in Seoul was delayed and kicked off 40 minutes later due to prolonged admission into the event hall. In the same concert, the show had to stop for four minutes after the on-set screen did not function well. Yunho and Changmin each celebrated their 21st and 19th birthdays on stage towards the end of the concert on the third day of the February 2007 Seoul concert. The celebration was filmed and recorded into the tour’s live DVD. TVXQ! visited Taipei on August 23, 2007 to promote the October concert and held a stamp fan-meeting event in the evening in Taipei International Convention Center. 500 fans were given the chance to receive 500 cards autographed by the members. TVXQ! 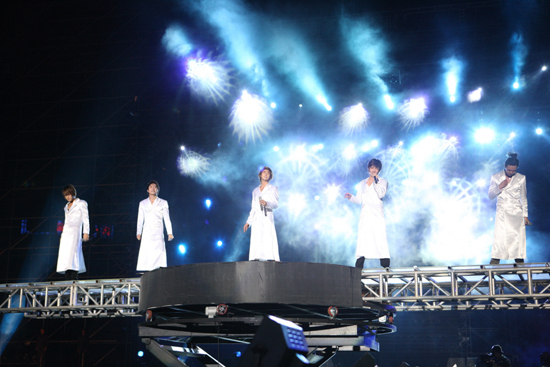 performed and concluded the show in the heavy rain on October 5, 2007. The strong winds and rain had caused hindrance to the performances as well as slippery stages. The concert producers were afraid that accidents may happen due to the typhoon and had insured a total of TWD 90 million (approximate USD 2.9 million). 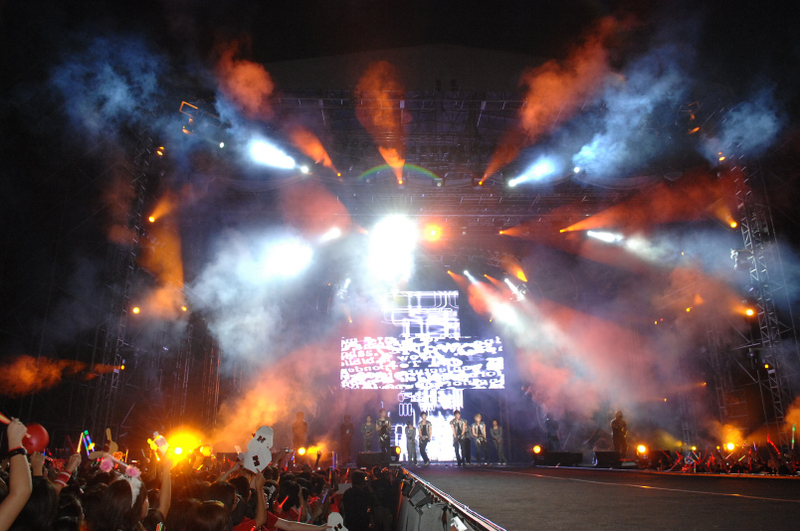 One of the two scheduled shows in Taipei was cancelled after government advisory for all residents to stay indoors due to the Typhoon Krosa that struck the country on October 6, 2007. Tickets were refunded on the following Tuesday. The cancelled performance reached an estimated cost of loss of around TWD 30 million (approximate USD 970,000). 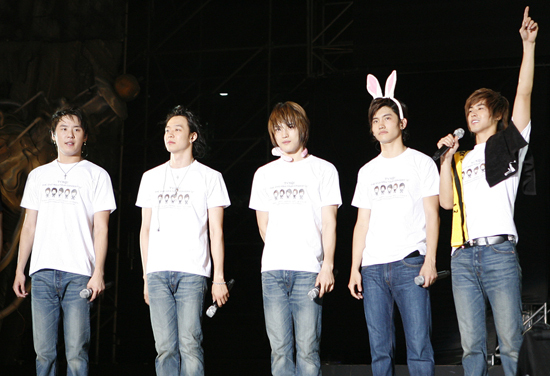 The group members returned to Taiwan for an encore in May 2008 to keep their promise to their fans. Kim’s birthday celebration in Bangkok. Photo: S.M. Entertainment. On October 25, 2007, Yunho suffered a lumbar vertebrae fracture while rehearsing for their three-day encore concert in Seoul. An official said it would take about three to four weeks for him to recover. Yunho later apologized to everyone and expressed his regret for not being able to give his best of performance for the encore and following concerts in the tour. Despite the injury, the singer stayed on stage to perform but avoided heavy choreography. A platform was set up specifically for Yunho to sing his part while the other members were dancing on stage. He would later join his teammates during ballads. Yunho fully recovered and got back on stage in time for their Bangkok shows. 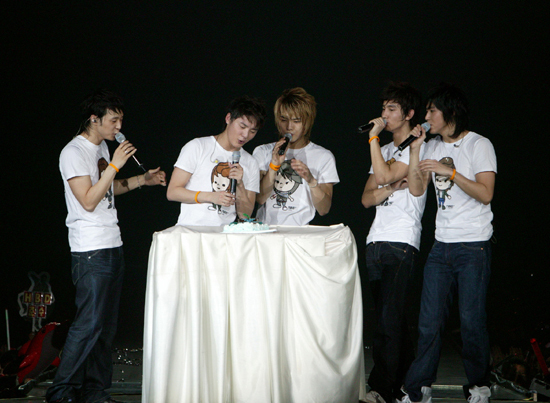 In Bangkok, Junsu celebrated his 21st birthday on stage towards the end of the concert on December 15, 2007. The celebration was filmed and recorded into the band’s 16th Japanese single, Purple Line. The concert in Shanghai was organized as a benefit concert in contribution for the needing victims of the 2008 Sichuan earthquake in China. The Shanghai leg was supposedly the grand finale of the tour but after some schedule adjustments, Beijing took its place as the Asian tour finale instead. TVXQ! performing “Phantom” in Seoul. Photo: S.M. Entertainment. 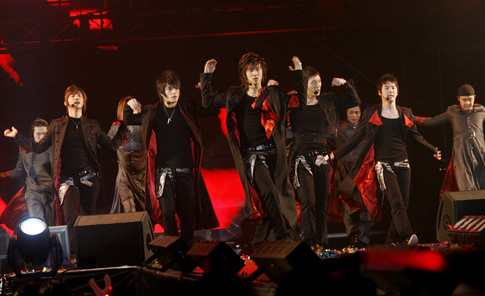 In the first Rising Sun tour in 2006, the shows expressed the creation of TVXQ! through capsules on stage. In this second tour, they used screens to express both the extinction of human race and creation of TVXQ!. In the O concert, evil tried to take control over the last humanity who survived, and wielded power over the devastated Earth, ruined by war and pollution. TVXQ! as warriors of peace rose against evil to save humanity. TVXQ! brought a world of innocence to children and hope to humanity. The Earth later received a new world of peace by the five TVXQ! warriors. This show was of a new format that gave a movie-watching sensation to the audience. Using “O”-Jung.Ban.Hap. as the basic theme, the concert held a message to bring about a world with new hope and peace. ‘One with audience’ was the stage concept for the tour. The stage was planned in a way that the audience can be much more engaging with the performers and also designed for the audience to see TVXQ! as closely as possible. The wire action during the theatrical performance before “One” brought a fantastic stage. TVXQ!’s appearance to rescue a girl fallen into the water received the best applaud from the audience. A bicycle was once used on stage in the 2006 Rising Sun tour and it suited well with the youthful and lively image of TVXQ!. They presented the bicycle again in this tour during “Drive”, where it was separated from a modified car. 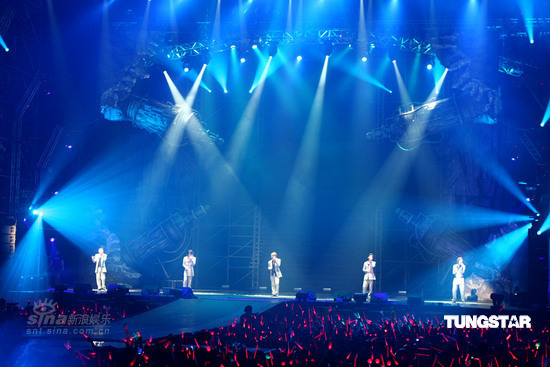 A rotating 360 degree stage was used in “Remember” for TVXQ! to face the audience in every direction. The stage vibe changed into a cuter image in “Balloons” when TVXQ! used mini character airplanes to travel around on stage. The airplanes used were sent to the members after the tour concluded in 2008. The concert stage in Kuala Lumpur. Photo: Babyboss Pictures. The concert stage in the tour was of sizes 22m x 16m x 16m and the stage itself cost nearly KRW 1.6 billion (approximate USD 1.5 million). In Beijing, the distance between the stage and the seats around it was just 10 meters away. Over CNY 10 million (approximate USD 1.6 million) was invested in the Beijing show. All concert materials and equipment including the lighting, audio, multimedia, costumes, and stage designs were the same as the Seoul encore concert. TVXQ! changed into 14 different sets of costumes in each show. TVXQ! premiered new costumes for certain performances when the encore concert in Seoul began. The new set of costumes were later used for the following shows until the end of the tour. The concert began with the sound of a siren and various clips featuring gruesome war combat were played on screen. The five TVXQ! members arrived in one of the war zones and replenished the damages caused by the destruction. They were later introduced individually on a large cross-shaped screen on stage and appeared altogether on a screen. The vertical screen then rose and revealed five men in a recessed wall behind the screen. As soon as the screen went down again, the stage was brighten and TVXQ! immediately appeared from the bottom of stage and the introduction ended with a narration, “This of kind concert.” The trick for the men in that recessed wall were not actually the TVXQ! members. 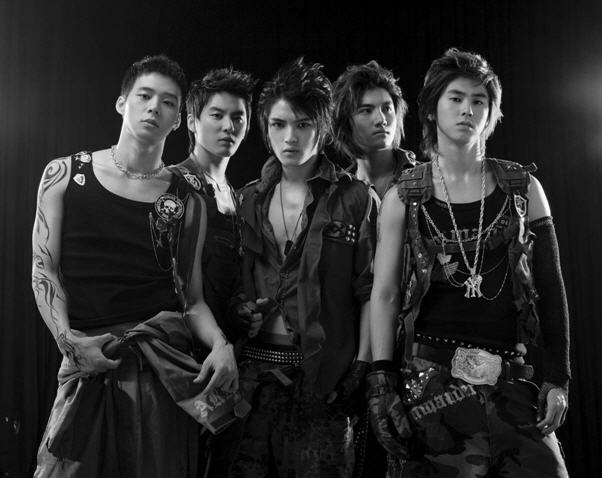 Reports claimed that five dancers had to wear the same costumes and had the same hair styles as TVXQ! to achieve that trick. Others believed that wax figures were used instead. TVXQ! started the concert with “Phantom” as the first performance. During the theatrical performance for the prelude of “One”, the interlude showed a sorrowful girl falling from a cliff and sank into the ocean below on screen. The concert stage then changed into a scene of the deep water. A white fabric in front of the screen was projected with bubbles from the stage lighting. A female dancer was hung from a 17-meter high wire and dove into the bottom of the stage to enact the scene. A male dancer then appeared from the above to her aid and brought her back to the water surface. The TVXQ! members were later seen diving from the stage above to the ground below to start their next performance. In South Korea, Mnet aired a 40-minute ‘Mnet No Cut Version – The 2nd Asia Tour Concert “O” in Seoul Concert Secrets’ broadcast that featured TVXQ! filming for the “Drive” interlude and rehearsing for the acoustic version of “믿어요(I Believe)” with the band in studio. A 20-minute cut version was aired on Mnet for its Wide Entertainment News segment on February 26, 2007. This broadcast showed the production of the tour, filming for the concert’s interludes, rehearsals in the studio and interview sessions with members. The filming for the entire concert production took about 96 hours before it was made to the TV. TVXQ! performing “You Only Love” in Kuala Lumpur. Photo: S.M. Entertainment. 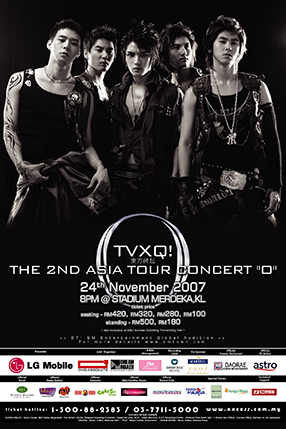 A recording of the concert in Kuala Lumpur was televised, and it aired on Astro channel AEC on February 7 and 8, 2008 in Malaysia. 14 performances including five solos were aired as a part of a program for the Lunar New Year. On August 27, 2009, the Japanese broadcasting channel, TBSch., aired several performances that were recorded professionally by the production crew of S.M. Entertainment from the February 2007 concert in Seoul. Highlights from the Beijing concert and interview sessions with the band were aired on Arirang TV under the ShowBiz Extra program on July 18, 2008 and on Mnet for its Wide Entertainment News segment. The February 2007 shows were chronicled in a documentary book. The book comes with 142-page photo book and a special animation VCD, which was played in the concerts before “풍선(Balloons)”. It was released on April 6, 2007. A canvas shoulder bag was later released with the documentary book as a special limited edition package on April 30, 2007. 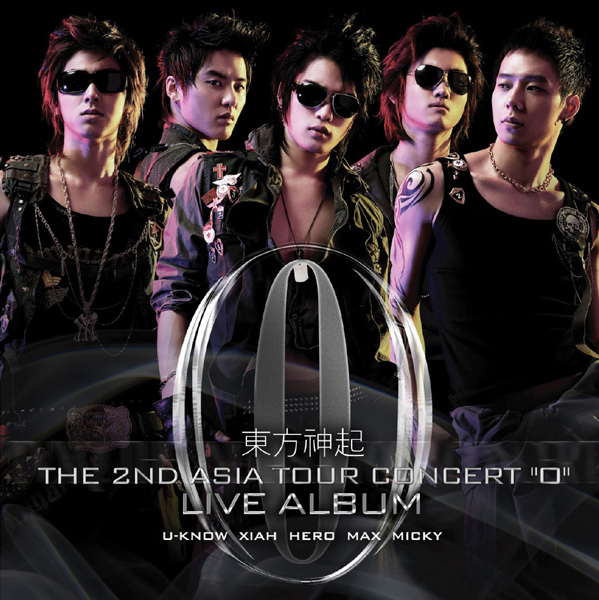 The shows in Seoul were recorded into a live CD and a DVD, which were sold separately while the tour was still ongoing. On June 18, 2007, the live CD that was recorded from February 23 to 25, 2007 was first released. The release came with a double CD and a photo booklet. Two solo tracks “My Page” and “Spokes Man” were released in studio version as bonus tracks. Avex Taiwan released a Taiwanese edition for this album on July 20 2007, which comes with a folded leaflet of Chinese lyrics. A 2CD+DVD version was later released on September 28, 2007 in Taiwan. The DVD consists of back stage footage of the Seoul concert and “세상에 단 하나뿐인 마음(You’re My Miracle)” official music video containing montages and various captures from the shows in Seoul. TVXQ! performing “One” in Taipei. Photo: TungStar. The live concert DVD was sold on December 6, 2007. It was released as a 2-disc DVD with a holographic cover, including a 52-page color photo book and a mini 2009 standing calendar. The second disc includes concert rehearsals, backstage, interview footage, and “세상에 단 하나뿐인 마음(You’re My Miracle)” music video. The concert was filmed on February 25, 2007. A 3-minute clip of the concert poster and promotion photo shoot scene was filmed and released in the fifth disc of the 5-DVD ‘All About 東方神起 :: Season 2′ documentary on November 21, 2007. The entire photo shoot was carried out in Japan. 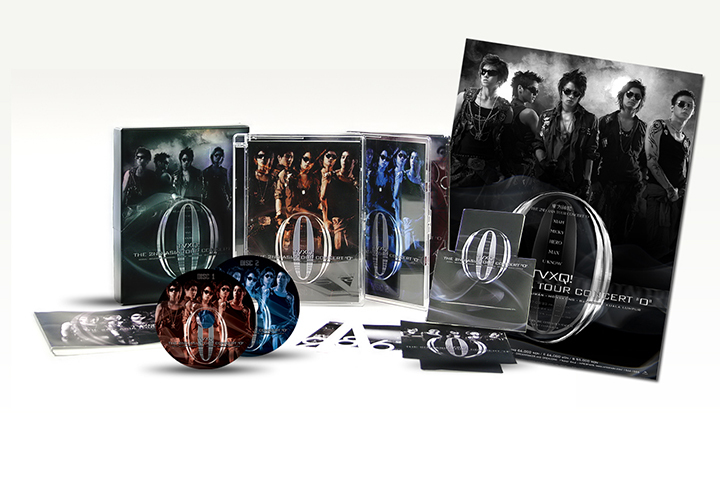 TVXQ!’s backstage, interview footage with members, and concert highlights of the Bangkok shows were released in the CD+DVD version of the 16th Japanese single Purple Line on January 16, 2008. The birthday celebration of Junsu on December 15, 2007 in the same show was recorded for a special off shot movie in the same DVD that runs for a total 10 minutes. A Korean version of the single was also released later that month on the 23rd in South Korea. The crowd in TVXQ!’s Bangkok show. Photo: S.M. Entertainment. According to Interpark’s “2007 First Half of the Year Concert” chart results, tickets for the February shows in Seoul had a whopping amount of 11.5% of the first half of the year’s tickets, becoming the highest amount of tickets sold for a concert. 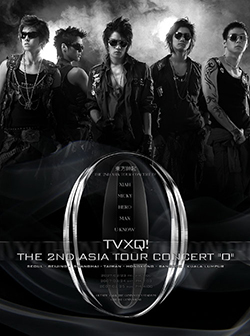 33,000 tickets for the three-day encore show in Seoul in October 2007 were completely sold out. The ticketing site crashed just two seconds after the ticket launch as 300,000 fans rushed to book their tickets. All 33,000 tickets were sold out after the site’s server was restored. Local police looked into complaints after fans were tricked into buying fake concert tickets for up to KRW 90,000 (approximate USD 81.00) that were out for “resale” on websites for the shows in Seoul. There were over 150 people who were victims of the ticket fraud, which cost for a total of over KRW 11 million (approximate USD 9,900). 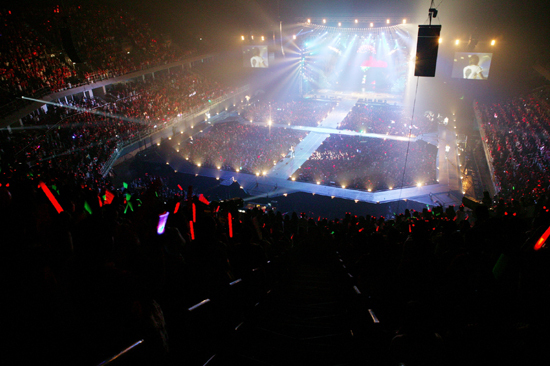 The show on February 23, 2007 in Seoul attracted 1,500 fans from Japan, China, Thailand, Singapore, Malaysia, Vietnam, and the Philippines. After the show ended, it took nearly five hours for fans to retrieve their belongings that were seized during the concert including cell phones and digital cameras. President of Avex Group, Masato “Max” Matsuura, attended the February 25th show and described it as “splendid”. In his blog posted on the following day, he reviewed the concert as “has all three components of dance, vocal, and visual”. Girls’ Generation and Super Junior were the featured guests at the Seoul encore concert. It was reported that 16 female fans fainted during the October 2007 concert. In Taipei, more than 1,000 fans filled the Taoyuan International Airport on August 23, 2007. TVXQ! set a record for having the most people to pick them up in Taiwan. Over 1,700 fans attended the stamp fan-meeting event which was held on the same day. Among the attendees, 500 fans were chosen to receive cards signed by the TVXQ! members while the others were allowed to witness the whole session. TVXQ! on stage in Shanghai. Photo: S.M. Entertainment. In Bangkok, 125 outlets in a Thai department store were forced to close down temporarily after 15,000 fans and reporters flocked to the venue for the press conference. 150 fans and reporters attended the press conference in Shanghai. Fans wore yellow ribbons during the show as a symbol of peace and good wishes for the 2008 Sichuan earthquake incident. After the concert ended in the evening, fans reportedly stayed in the event hall and had paralyzed both human traffic within the stadium and even for cars travelling in the vicinity of the stadium for 30 minutes. The finale show of the tour in Beijing gathered 20,000 fans including those from Korea, Japan, Thailand, Singapore and China, and TVXQ! had set a record as the biggest turnout for a K-pop artist in Beijing at that time. The live album peaked the weekly chart at the 18th spot on Gaon Album Chart for the week May 23-29, 2010. In the 29th week of 2007, the Taiwanese live CD editions were sold across the country and was at the 14th spot in G-Music Chart. ● The Way U Are_Remix Ver. Seoul encore concert goods. Photo: S.M. Entertainment. 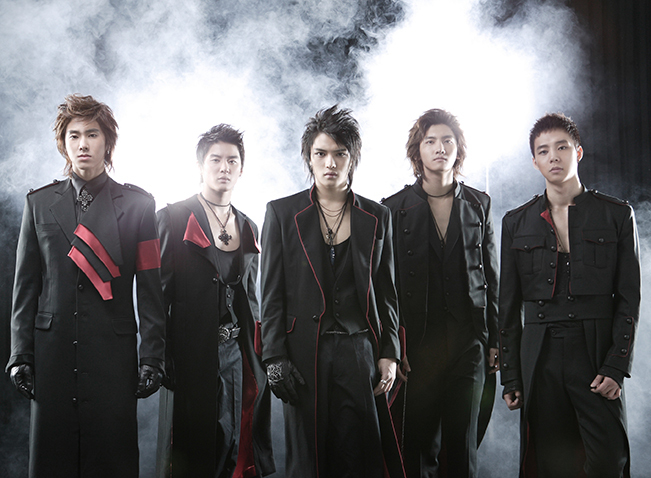 In February 2007, six official merchandise were sold in the Korean leg. A special concert book contains TVXQ!’s third studio album activity photos, stills from the making of their second theatrical drama, Dating On Earth, photos from their Rising Sun tour in Bangkok, and concert posters. A new Concert Book Ver 2.0 was introduced for the Seoul encore concert. The 40-page color photo book contains photos from the February 2007 shows in Seoul and a sheet of sticker set. A Taiwanese edition of the book, Concert Book Ver 2.1, was released. It was sold in Taipei in May 2008 and includes 42 pages of photos taken from the past Seoul concerts, 2007 Taipei concert and press conference. This list is representative of the sales in Seoul. This list is representative of the sales in Seoul encore. Casting & Training: S.M. Artist Development Dept. This page was last modified on February 2, 2015.